The Springfield Armor chose a great time to get their first lead of the game. With under a second in the game, Scottie Reynolds drained a step back three from the top of the key to give the Armor an 88-85 lead with only .2 seconds remaining. The Armor went on to win by the same score Friday night at the MassMutual Center in Springfield. The fourth quarter began with Springfield cutting the lead to 3. But that was quickly erased after Maine went on a 12-4 run. That’s when Reynolds took over. After a beautiful reverse lay up to cut the lead to single digits, he was fouled on a 3 point play that brought the lead down to just 6 points. Later in the quarter, Reynolds intercepted a pass and hit L.D. Williams for an easy lay-up. 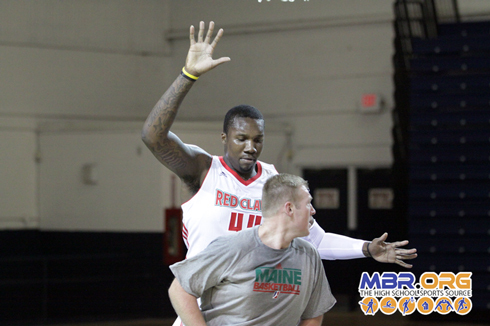 Once again the Maine extended their lead and with under 2 minutes remaining, Red Claws forward Tiny Gallon stretched the lead to 85-77. But Reynolds answered. Reynolds drove to the basket, banked the lay-up and was fouled. A successful Reynolds free throw brought the lead back down to 5. L.D. Williams again made a big basket as he stole the ball and went the length of the floor for the score. After a defensive stand, the Armor had the ball on the sideline following a timeout. L.D. Williams, taking the ball out, hit Reynolds on a curl, as Reynolds once again finished with a reverse lay-up. Following the play, the Armor defense picked up just like its offense. Red Claws point guard Lawrence Westbrook drove to the lane, but Jerry Smith planted his feet and took a charge, giving the Armor the ball back and setting the stage for Reynolds. With under 5 seconds Reynolds attempted to drive to the basket, but was cut off by Maine defenders. He instead stepped back and hit nothing on the net, as the crowd of 2,404 went nuts. The Armor improve to 2-1 on the season as the Red Claws fall to 1-2. Both teams will play again Saturday at noon at the MassMutual Center.